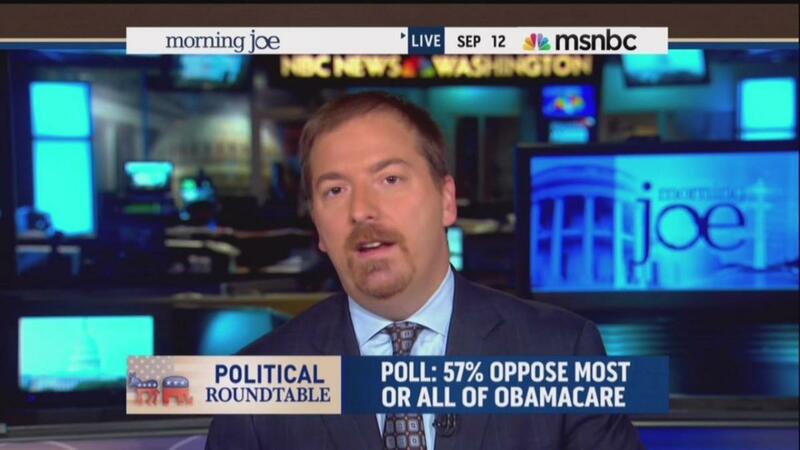 President Obama’s signature health care law continues to lose support, but NBC’s Chuck Todd sees no problem with the law itself. On Thursday’s Morning Joe on MSNBC, he chalked up the declining support to bad messaging by ObamaCare supporters. It’s not that the president and others haven’t tried to defend ObamaCare, but some of their original talking points have already been discredited. Obama has often claimed, for example, that if you like your current health insurance, you can keep it. But the Congressional Budget Office has estimated that 7 million people will lose their employer-based insurance coverage because of ObamaCare. Who knows if Democrats just need to try harder to convince us of the wonders of ObamaCare. One thing we do know is that they don’t need to convince the journalists of NBC and MSNBC, who appear to remain firmly in support of the health care law despite its flaws. JOE SCARBOROUGH: A couple of stories to talk about. We’ve got the Colorado recall first of all and wondering what the national implications of that will be, and secondly this new poll showing that the public is souring even more on the president's health care plan. According to CNN survey, 57 percent now oppose most or all of the law. That's up 13 points from January according to the same CNN poll. When they asked who would be responsible for a government shutdown, 51 percent said Republicans, 33 percent said President Obama. But the polls aren’t the only headache for the White House. Now America’s – you heard this – largest labor union, the AFL-CIO – they’re now demanding serious fixes to the law. Chuck, I'm telling you this law gets more unpopular by the day. I don't know that I’ve seen anything like this before. CHUCK TODD: Well, and the White House has done nothing to try to fix the PR on this and the Democratic Party has done nothing to try to fix the PR on this. SCARBOROUGH: And I’ll tell you what, I know you've seen these commercials, Chuck, and they’re running these commercials everywhere. They even run these commercials on MSNBC. You’ve got Mike Lee, most of the time who actually is a really good spokesman for the group, but you got – because he's not running for president and you look at him and he's -- no, I'm dead serious. TODD: It's true. He’s the most clear – brings the most clarity to the debate. SCARBOROUGH: A genuine look about him. But those 30 second commercials on stop ObamaCare, stop ObamaCare by the Senate Conservative Fund, they’re running them nonstop and Democrats are on the defensive. You see absolutely no counter to any of that stuff and you look at the polls, there's a good reason why. I mean they are – ObamaCare continues to bleed support every day. TODD: It is. And if they did spend some time building support for it, they’d get the Democratic base back in favor of it at a minimum, and it would be closer to being, you know, like most every issue now in the country that is polarizing between the two parties, back at parity, but they’re not even trying. You talk to the White House about this and they just say, you know what, we're busy trying to implement the law and once it's implemented, once they water the tree and the roots get in, then it’ll get popular. But you know, I remember hearing that from Nancy Pelosi: oh, we'll worry about it when the law is passed, then we’ll explain it and sell it to the American people. SCARBOROUGH: Yeah, her exact quote was, ‘We need to pass ObamaCare so we can figure out what's in ObamaCare.’ I’m still trying to figure that one out all these years later.